← What’s so special about this beetle? Bruneau Sand Dune tiger beetles caught in the act! The newest issue of CICINDELA (“A quarterly journal devoted to Cicindelidae”) contains an interesting article by my good friend and fellow tiger beetle enthusiast Kent Fothergill, who presents a fascinating sequence of photos documenting a field encounter with a mating pair of the endangered Bruneau Sand Dune tiger beetle (Cicindela waynei) (Fothergill 2010). This is one of several tiger beetle species in the C. maritima species group that inhabit sand dunes in central and western North America – others include the Coral Pink Sand Dune tiger beetle (C. albissima), the St. Anthony Sand Dune tiger beetle (C. arenicola), the Colorado dune tiger beetle (C. theatina), and the sandy tiger beetle (C. limbata). With the exception of the latter, these species show highly restricted distributions in their preferred sand dune habitats, and because their populations are so small they are especially vulnerable to drought and ever-increasing anthropogenic pressures (i.e., invasive plants, motorized vehicular traffic, overzealous collectors). While the Bruneau Sand Dune tiger beetle has not been accorded status on the Endangered Species List, the Idaho Department of Fish and Game and the Bureau of Land Management have classified it as globally imperiled. Bruneau Sand Dune tiger beetle, Bruneau Sand Dune State Park, Idaho. Photo © Kent Fothergill 2009. Kent was observing these beetles in Bruneau Dune State Park in southwestern Idaho – the main habitat for this species – when he encountered several pairs of C. waynei in the process of mating. Photographs were taken of one mating pair, revealing a fascinating sequence of behaviors that included vigorous but unsuccessful attempts by the female to dislodge the male, eversion and penetration of the female by the male aedeagus, and subsequent mate guarding (see photo above). 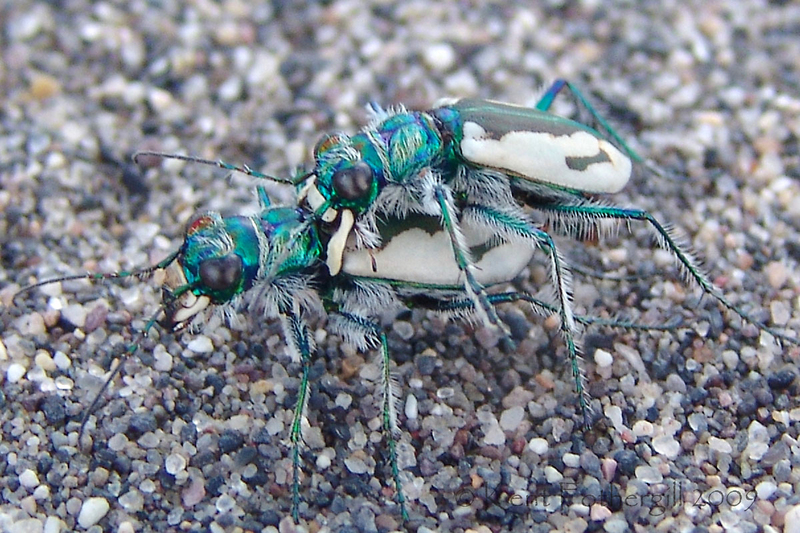 It is, in fact, this latter behavior that is most often observed among tiger beetle mating pairs and not actual mating itself, which is only rarely observed. Kent noted the uniquely modified male mandibles (see photo below) and their possible role in preventing the male from being dislodged during the female’s initial protestations. Male Bruneau Sand Dune tiger beetles sport impressive choppers! Photo © Kent Fothergill 2009. This apparently is the first documented report of mating in this species, and its occurrence in May is considerably later in the season than Baker et al. (1997) speculated – significant because protection of 1st instar larvae is a management priority for conservation of this species. The potential occurrence of 1st instars during a longer period of time is an important consideration for continued management of this species, as the Bruneau Sand Dune population continues to show evidence of decline despite the prohibition of insect collecting, cattle grazing, and off-road vehicles within the park (Bosworth et al. 2010). Human trampling and pesticide applications to adjacent rangelands are continuing threats that have proven more difficult to manage. My sincerest thanks to Kent Fothergill for presenting me the opportunity to review his manuscript prior to publication and allowing me to reproduce here two of his spectacular photographs of this gorgeous and rare species. Baker, C. W., J. C. Munger, K. C. Cornwall and S. Staufer. 1997. Bruneau Dunes tiger beetle study 1994 and 1995. Idaho Bureau of Land Management, Technical Bulletin 97-7, 52 pp. Bosworth, W. R., S. J. Romin and T. Weekley. 2010. Bruneau Dunes tiger beetle assessment. Idaho Department of Fish and Game, Boise, Idaho, 36 pp. Fothergill, K. 2010. Observations on mating behavior of the Bruneau Dune tiger beetle, Cicindela waynei Leffler (Coleoptera: Carabidae: Cicindelinae). CICINDELA 42(2):33–45, 7 color plates. This entry was posted in Cicindelidae, Coleoptera and tagged beetles, behavior, conservation, endangered species, entomology, Idaho, insects, nature, science, tiger beetles. Bookmark the permalink. 15 Responses to Bruneau Sand Dune tiger beetles caught in the act! Wow…gorgeous TBs, not one but two – mating! I’m green with envy. Great shot! Thanks, Kurt – although Kent Fothergill deserves all the credit for the photographs. I sure hope to see this species for myself someday. These are lovely indeed. I’m fresh off of pouring over the plates of tiger beetles in my Pearson guide – and these are surely among the most beautiful. The chance to witness and document the mating behavior, timing etc, is just as awesome. The white on aqua is indeed a stunning color combo. You should see the rest of the photo sequence in the article! The white jaws are sooooo cool. They look like they’re made from porcelain. Can I be tangentially obnoxious and ask if you can tell us the species of this tiger we saw at the Cam Trap Codger’s workshop? Yep, the jaws have it! 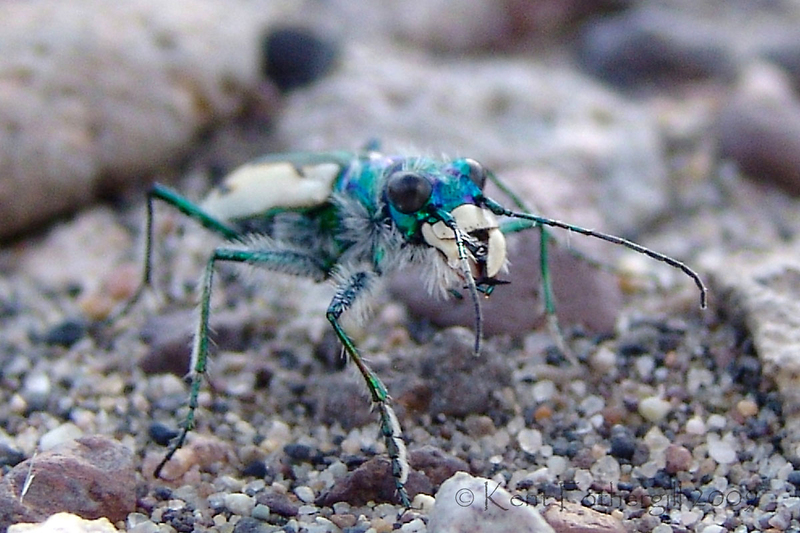 Presumably your tiger beetle was photographed in the Sierra Nevada, in which case I believe it is Cicindela tranquebarica sierra – the montane form of the species in California. Thanks much Ted. It was indeed in the Sierra Nevada (sorry for not including that – thought you would see it in the tags). Looking at Bugguide I’d say you’re spot on as usual. My pleasure, Ken. I didn’t see the tags, but then I’m not too fluent with Flickr yet. How does one subscribe to CICINDELA? It doesn’t seem to have a web presence and while I see it referenced all the time, I haven’t seen any official looking way of subscribing. Love the first shot, Ted. I’m a sucker for capturing nature “in the act”! Of course I’m quite enamored of the subtle color variations on their furry pieces and parts. Beautiful! Kent’s shots – though I certainly hope to get some of my own like this someday.